Not much is known about William O. Schmick. 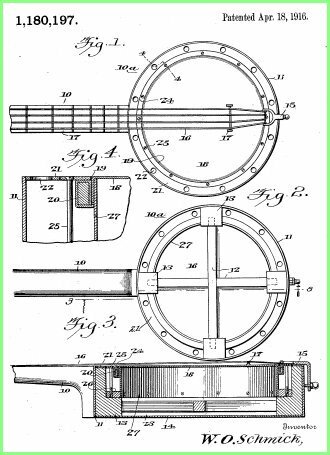 He applied for his banjo rim patent 09/23/1914 and patent #1180197 was issued to him on 04/18/1916. There were several other companies that used the "Lyric" name on their own manufactured instruments. Among them were Gretsch in NYC, and The Lyric Guitar Company in Kansas City (later moved to Independence), Missouri. There is a modern Asian import banjo which currently uses the Lyric name. 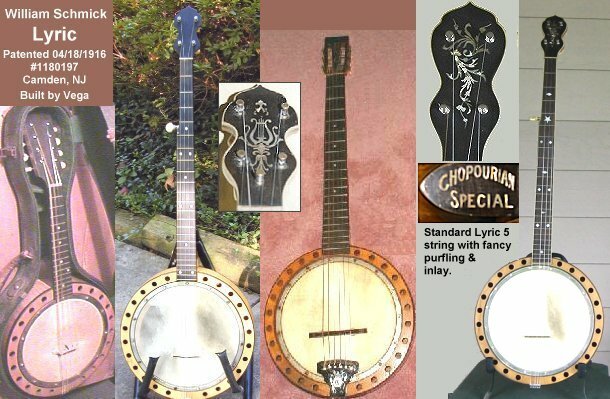 5 variations were made and sold -- tenor, plectrum, 5 string, mandolin and guitar banjos have all been seen. They were modeled after the zither-banjos invented by Cammeyer, and designed to be played with gut strings. These banjos, which were made to his order by Vega, probably inspired the deep-walled resonators of the Vega "Vox" line of banjos which was introduced circa 1928. 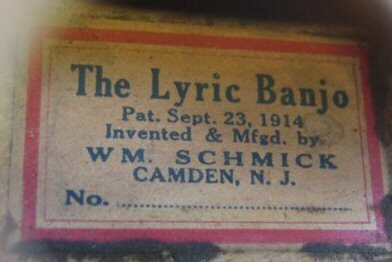 From 1925, Schmick's "Lyric Brand" banjos were distributed by the Carl Fischer Company. Note that the Fischer ad incorrectly lists the patent as the date it was submitted, rather than the correct, issued date. 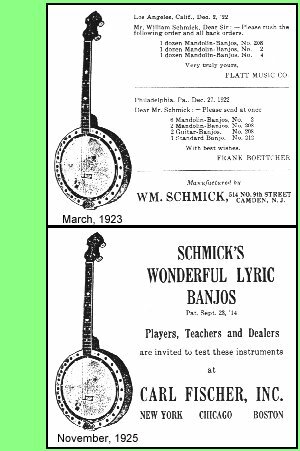 Lyric Banjos appeared in Fischer musical instrument catalogs through the late twenties, but in 1932, they were no longer listed. The banjo-mandolin pictured above has the standard "scallop-shell" style of mandolin tailpiece with a slip-on cover. The 5 string has a non-cammed "No-knot" tailpiece. The banjo-guitar does not have its original tailpiece and since this is the only one known, I don't know what tailpiece it came with originally. The fancy peghead inset is from a "Plectral 5" model, a plectrum length neck with 5 equal length strings, having all the tuners in the peghead, not a short drone as in the regular 5-string banjo. Further information, including better photographs or catalog pictures would be greatly appreciated. Harry J. Chopourian was a banjo virtuoso who played concert halls and was a soloist with symphony orchestras. He was said to have been able to play any music on sight. Whether the Schmick banjo so marked was his or a model named for him is unknown. He endorsed and played S.S. Stewart banjos before the turn of the century; there is one presentation model Stewart known with his name inlaid into the strut. Photographic essay showing a Lyric reconstruction project by Vinnie Mondello. 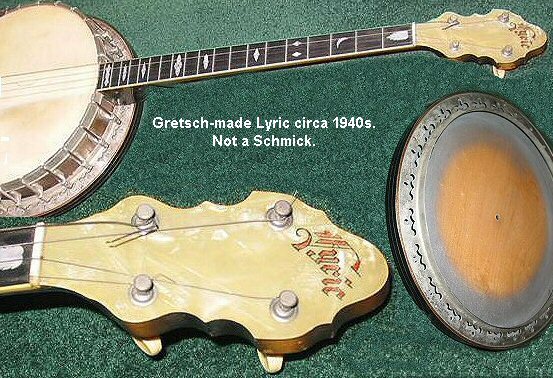 Photo showing non-Schmick Lyric, probably by Gretsch circa 1940s.